President bashes timing of indictment of 12 Russians accused of attempting to meddle in 2016 election, says US-Russia relations never worse. 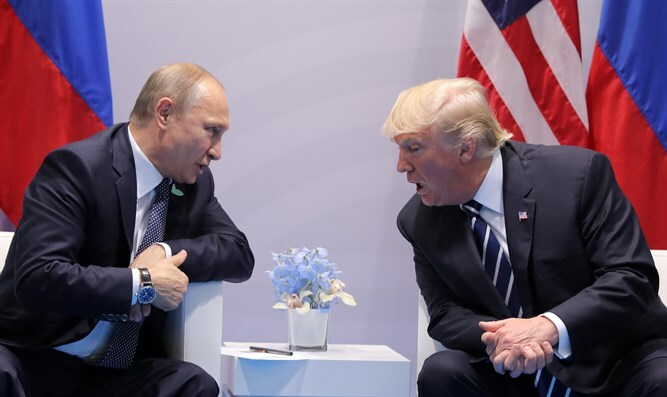 The relationship between the US and Russia has “never been worse”, President Donald Trump claimed Monday morning, ahead of a planned meeting with Russian President Vladimir Putin. In a tweet Monday, the president decried the timing of Deputy Attorney General Rod Rosenstein’s announcement on Friday of the indictment of 12 Russian intelligence officials suspected of attempting to meddle with the US presidential election in 2016. “Today, a grand jury in the District of Columbia returned an indictment presented by the Special Counsel’s Office. The indictment charges twelve Russian military officers by name for conspiring to interfere with the 2016 presidential election,” Rosenstein said Friday. The announcement came just days before President Trump was set to meet with Russian President Vladimir Putin at a summit in Helsinki. President Trump and First Lady Melania arrived in Helsinki Monday morning, where they were greeted by Finland’s President Sauli Niinisto ahead of the summit with Putin. Ahead of the summit, Trump said the US-Russia relationship was at a new low, blaming US “foolishness” and the ongoing special probe into allegations of collusion between the Trump campaign and the Russian government. On Sunday, President Trump told CBS he had “low expectations” for his meeting with Putin, but added “nothing bad” would come out of the talks. "I go in with low expectations," the President said. "I'm not going with high expectations."